"The Art Market showing signs of the global slump? Methinks not !" Damien Hirst a British artist realized one hundred forty million US dollars in a Sotheby's September 2008 art sale during a world-wide financial market crash. As the fine-art market sails blissfully along despite the financial chaos and disasters Rembrandt visits the booming fine-arts section of the San Romolo Fair. The centuries-old open-air market takes place every year on October 13th in San Remo on the Italian Riviera. Rembrandt is surrounded by dozens of stands that display for sale canvases, framed paintings and prints. 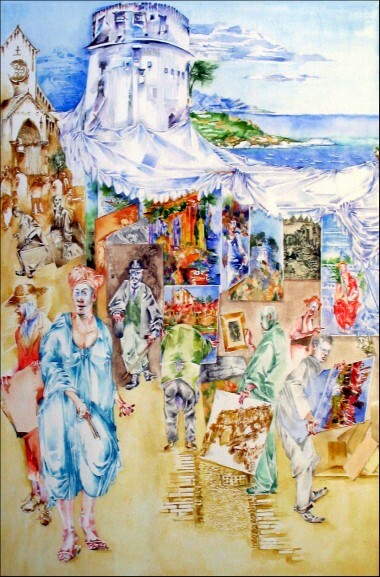 Spectators and art dealers crowd Sanremo's narrow stone-clad streets examining the works of art on display, or carrying away their purchases in the direction of the medieval cathedral of San Siro on the top left of Matthew Moss' painting. Rembrandt van Rijn is accompanied by his two perpetual companions, Vincent van Gogh, and, in the background hurrying to catch up, Henri de Toulouse-Lautrec. The basilica of San Siro, is a medieval cathedral of the twelfth century built over the remains of an earlier, Paleochristian church. The style of the church has altered over the centuries because of changes to church liturgy and not least, damage caused when Sanremo was bombed by the republic of Genoa's navy in June 1753 and again by the American navy in 1944. The painting you see hanging on the extreme right in the art market stalls is a recent oil on canvas by Matthew inspired by Giorgione's 'La Tempesta.' Entitled S.Devote*, it is a view of the Principality of Monaco. In it's foreground is the boat in which the legendary Saint Dévote, who is the patron of the Principality, was washed up on the coast of Monaco. She is seated to the left of the fortified medieval city's walls, holding a palm branch the symbol of a martyr. To the right of the cathedral of Saint Siro you will find a fortified tower, the 'Torre Ciapela or Chiapella.' This was built in the mid-sixteenth century to protect Sanremo's inhabitants from the Saracen pirates of the Sinai peninsula who, up to the eighteenth century, frequently raided the Riviera coast. In style, it is a little similar to the Martello towers built around Ireland in the early nineteenth century. The impressive building has one-meter-thick stone walls, once part of the Sanremo city fortifications.The top is furnished with openings to provide a line of fire for the defenders.